You can edit the skindefinition.xml file and change the size of the map, but it's not intended to be done, so it can not work or lead to report wrong coordinates when hovering the map with your mouse cursor. To restore fullscreen map just delete these line from the skindefinition.xml file. Last edited by Adra : 05-22-2016 at 10:47 AM. Any way to resize the map, it roughly takes 1/8 of the screen and even if a "windowed" map like that is appreciated in terms of not loosing sight of the game, with my resolution it is too small. I selected Full Screen since I thought "something" would make that easier for any troubleshooting, but when I restored my default view FullScreen Windowed, it picked up the Interface like a charm. As far as I can see right now, everything works, and looks, correct. Now I just have to align the toolbars, always a bit fiddly. Last edited by Marancil : 01-02-2016 at 09:10 AM. After editing /saving changes in xml files you must close then relaunch Lotro to apply the new values. Ensure both your monitor and lotro graphic options are set to 3840x2160, fullscreen mode. Secondly, after you have selected a skin on your character, unlog then relog it to get the custom panels and the toolbar correctly displayed. Last edited by Adra : 01-02-2016 at 07:48 AM. Thank you very much for this lovely skin. I write because I have some issues getting it to work on Resolution 3840x2160. in all relevant xml files, as specified, for all the variants of them toolbars. It does not seem to place the toolbar elements correctly, comes up with gaps and icons are not resized properly. The toolbars themselves end up centered. Only the Universal seems to position the icons more or less correctly but Store and Attack Circle are not aligned/resized. You do write about running in FullScreen (Windowed) might require additional changes in values, so I have not done that, I ran the test in FullScreen mode to give you proper feedback. I also include several screenshots of the layout, perhaps you can guide my efforts via them? Last edited by Marancil : 01-02-2016 at 06:22 AM. - The skill banks switching buttons (sword/shield/horse) became 99% obsolete since Update 12, as it seems Turbine will never fix the "amnesic" shield bank. 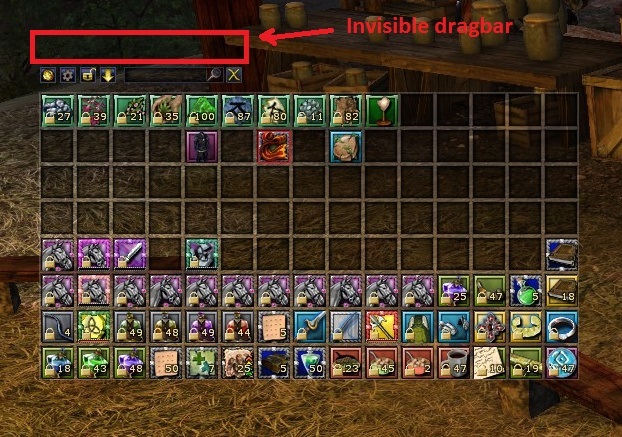 This JRR Azure Glass update hides this function on custom toolbars (= all but "Universal"), this means you won't anymore click accidentally on it during a fight ! 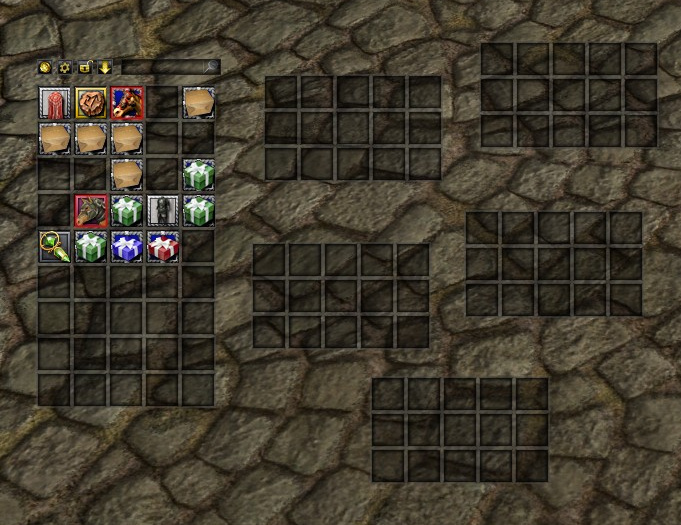 Please note that "1x1 BGM" toolbar has now its lotro store button located at the right. - Nothing more, nothing less. Turbine engineers haven't published new skinning pack updates since U14 (July 2014). For advanced users, here is the same custom code than in my previous comment, except it contains only the bag #1. This code is dedicated to players looking for transparency/minimal UI. As custom codes are not compliant for now with resizeable panels, this inventory panel is NOT RESIZEABLE on the fly, you have to give your bag the width/length you want before before appliying this skin code on your character, it will keep the bag settings you defined. You can still temporary get back to the default skin to resize your bag like you want. To implement it into a skin, open with notepad / wordpad the skindefinition.xml file of the skin you want to modify, go to the end of the file, then copy-paste the following code just before the last line " </opt> " , save the file, you're done. Now just restart lotro if it was still running to enjoy this new feature. To restore the previous bag appearance, just delete the code from your skindefinition.xml file. Last edited by Adra : 05-22-2016 at 10:32 AM. EDIT : Here you can find the code to display the 6 bags without borders nor title bar nor close button. Bag 1 is, by nature, a bit particular, but the other bags are displayed as they were in "ultra mini packs". Using this codes make the bags become no more resizeable. Last edited by Adra : 09-19-2015 at 08:34 PM. The customized bag codes were not functioning anymore, so I removed them from the skindefinition.xml files. This is a bit disappointing as I wanted to get rid of the title bit at the top of the inventory bags. <sigh> Oh well. Last edited by Earthsuit : 09-19-2015 at 05:17 PM. Indeed I forgot to delete this paragraph from the faq when the ability to merge the bags has been introduced in Lotro . The faq is now updated, thanks for your feedback. Last edited by Adra : 09-19-2015 at 05:08 PM. First off, thank you for these wonderful skins. Most especially all the hard work AND for maintaining the project. Thank you. Advanced users can choose to revert it by deleting the whole "Ultra Mini-packs" section in the skindefintion.mxl file of every skin they wanna fix, and repeat this operation after every Azure Glass update. However, I find this is not a default behavior nor can I find any sections in the skindefinition files named "Ultra Mini-packs" or any variation of that. Has this feature been changed in the latest version? Am I looking for the wrong sections? Last edited by Earthsuit : 09-19-2015 at 12:20 PM. Last edited by Adra : 02-17-2015 at 12:07 AM. you can edit the skindefinition.xml file of the skin you're using with any text editor, like Window's Notepad, and delete the paragraphs dedicated to the extended panels. you can use the SmallBar addon for JRR skin collection. This addon contain 1 profile containing no extended panel. There is no other easy way to change the size of most the panels without entering into the details of the code defining the panels, and there are a lot of values to modify to resize a panel. Last edited by Adra : 02-10-2015 at 05:53 PM. Which menus are you talking about ?